An elegant form-fitting design, the vi-s is one part graceful fashion sandal, one part hard-working cross trainer. A flexible yet high-traction sole makes the demands of every day life feel effortless. Delicate lace fabric adds a sensual touch that's deceptively tough, like you. Vibram's Five-fingers v-trao running shoes provide the perfect balance of proprioception (foot sensory impact) and protection on rugged surfaces. Our two-color 5mm Vibram rubber sole provides impact protection from stones and debris, whilst allowing a more natural running style. The aggressive tread design and Vibram 3D cocoon technology molded into the sole delivers sure-footed grip and protection in all directions. All in all, the v-trail is the ideal choice for the barefoot runner who is looking to take their style to the tough terrain. When you're scrambling up a Rocky bluff or bounding along a riverbank, the last thing you want is gravel and grit seeping into your Five-fingers. The KSO is and all-new design with thin, abrasion-resistant stretch polyamide and breathable stretch mesh that wraps your entire forefoot to keep stuff out . A single hook and loop closure helps secure the fit. Non-marking xs trek performance rubber soles are razor-sipped for sure grip. The signature FiveFingers water sport shoe, the Signa is ultra-thin, flexible and lightweight. An ideal shoe for rowers, surfers, kayakers and SUP fanatics, the Signa provides grip and comfort out on the water and packs easily into a dry bag at the end of the day. 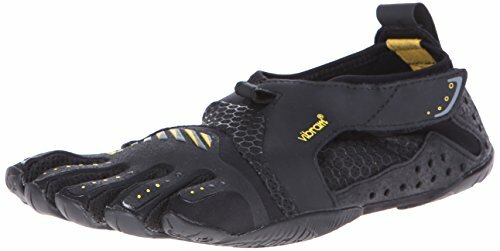 Shopping Results for "Vibram Womens Five Finger"